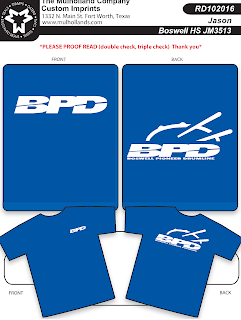 For those that were not at the meeting last week, we decided to stick with our BPD shirt and move to a Boswell Blue Color. This is a proof of what the shirt will look like. Our goal is that all parents will be willing to purchase 1 shirt so we show a united presence at contest and games. If you have not already placed your order, and would like a shirt, please respond to this email by Wednesday, August 20th. The cost will be $15 (S-XL) and $17 for (2XL and above). Just to clarify, your students will be receiving 1 shirt, so only place an order for any additional shirts you would like for family or your student. I love being able to say "Thank You" so often to this group of parents and students. YOU GUYS ARE THE BEST! We had an amazing band camp dinner and earned over $800 in just a few short hours. I am beyond grateful!! BAND MAKE-UP REGISTRATION DAY Tomorrow night is Band AND Drumline make-up registration day! If you have not registered your student, please plan to attend this make up session. The battery will be joining Mr Spoon this Saturday for the Community Link Mission Back to School Bash. All 3 High School Drumlines will be performing. We will be up 1st, so we must arrive no later than 8am at TCC. Mr Spoon will be communicating more as the week comes to an end. This is such a great way for our kids to give back and support a HUGE event for Community Link. It was so great to meet all of you this last week at registration. If you were unable to attend, please email me back and let me know when we can get your student registered for the BPD 2017-18 Season. The kids have been hard at work already this week at Drum Camp. They will be participating in the grand opening ceremonies on Friday for the new Kroger. This will be a great event for our kids to be showcased at. We will be moving our monthly drumline parent meeting to Tuesday, February 7th at 6:30pm in the black box. Mr Spoon wanted us to meet a little sooner before our 1st contest happens on the 18th. Please mark your calendars accordingly. The February payment is now due. Please plan to mail or bring to the meeting next week. Lots of things are happening and it is very exciting but it requires that we all pay timely. The prototype for the props will be complete by this week. Mike South is looking for several hand to help him build the remaining 4 pieces. Our goal is to be using our props for every contest. With this as the goal, we will need 4-5 dads (or moms) to help at the South house this Saturday and next to complete these on time. His cell # is 817/233-1839. Please text him if you are available to help.